Please consider donating to this wonderful organization! 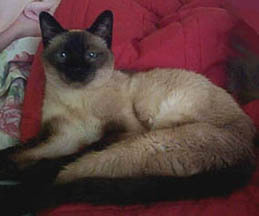 Prior to 1997, the only cat I had was a beautiful sealpoint Siamese, Cica. that started us on our many-year's journey of being a multi-cat household. How many cats did we have? Well, at one point we had a total of eight resident felines! 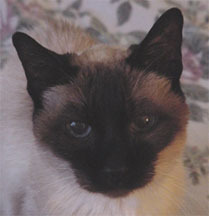 Over the years, as our kitties (and doggies) have aged and/or developed health issues, we've lost them, one by one. Each loss has been hard; some losses have been devastating. 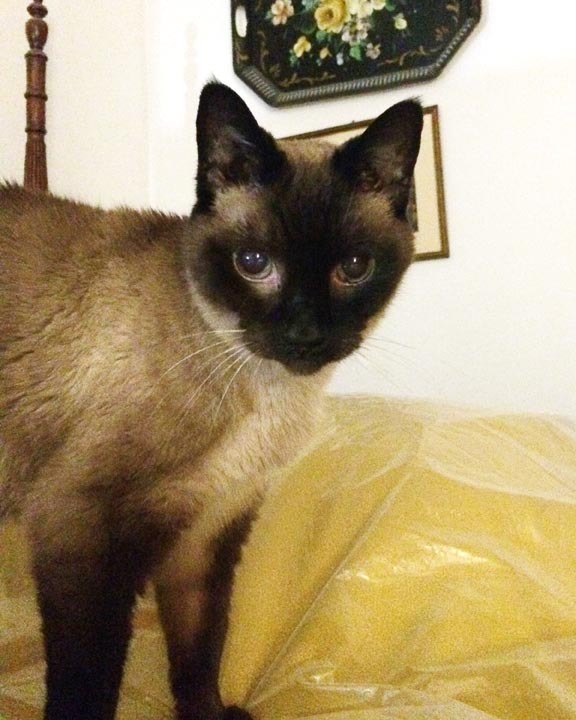 Kian, an elderly Sealpoint Siamese, is my only kitty now. My "grandcat," Simon, lives with my oldest son and his wife in Tennessee. and he was so very little that we had to bottle-feed him! There are lots of "Baby Simon" posts on my blog, "Simply Art-Rageous!" 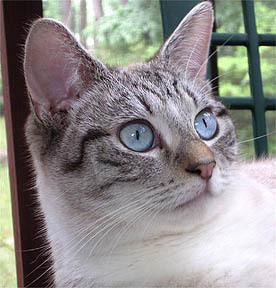 I became involved in the "TNR" program - Trap, Neuter, Return - that is offered through our local SPCA. As of March 2017, I have trapped, had spayed/neutered, and returned 6 beautiful, healthy adult ferals. I've also trapped 5 kittens who have all been socialized and then adopted through the SPCA. 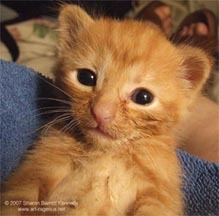 Information on my on-going TNR efforts may be found on "Simply Art-Rageous!". The picture on the right was taken just days after Cica's 20th birthday. 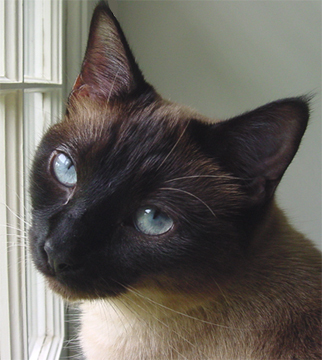 A beautiful Sealpoint Siamese, Cica was my best friend for over 20 years. 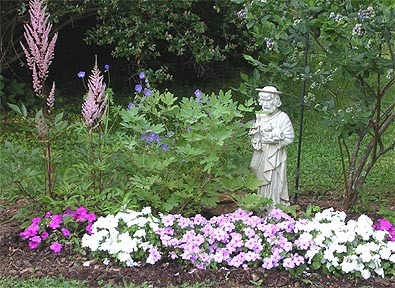 This memorial garden was created over her grave. 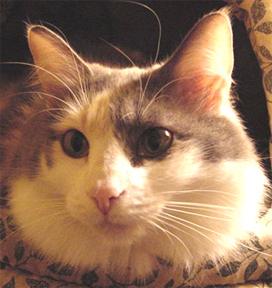 "A Special Tribute to a Much-Loved Dog"
Cirrus was an enormous fuzzy cat with a wonderful, affectionate personality. 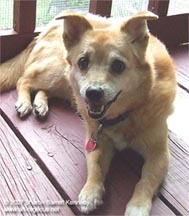 She was adopted from the SPCA in June 1997.
after seeing his picture & bio on Petfinder.com. We adopted him on November 22, 2003. Chessie Cat (aka "Cat") belonged to my uncle. After his death in December 2005, my mom took her in and gave her a home. After my mom's death in November 2012, she came to live with me. 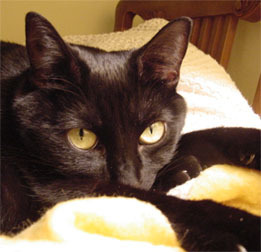 My youngest son was Eclipse's chosen "purrson" and she was the first kitty in our family to go to college! 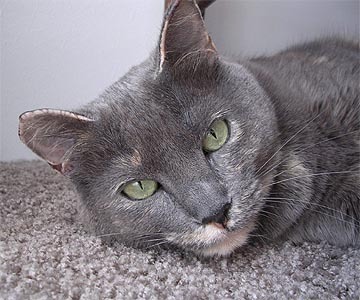 She was adopted from the SPCA in June 1997 and lived in Colorado with my son. 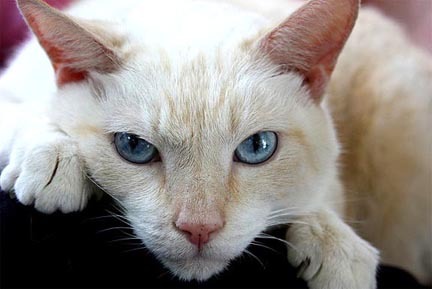 My beautiful flamepoint Siamese, Kai, was one of the "Three Meezeketeers". 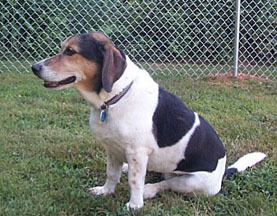 He and two of his siblings were adopted from a shelter in June 2002. Kai's death was completely unexpected. The vet who helped him to the "Rainbow Bridge"
said that he probably had hemangiosarcoma, the same silent form of cancer that took my dog Spotty's life. 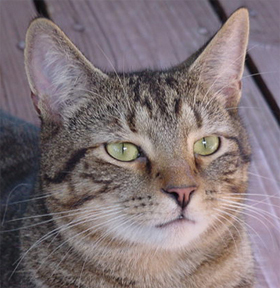 Riley was a survivor, and he apparently had far more than the allotted "nine lives." I hope that she and Riley have found each other. ...and we have a lot of deer that visit, too. Too many wonderful--but unwanted--animals are dying in shelters. Rescue organizations do what they can, but there just aren't enough adopters or foster homes to deal with the number of animals who are abandoned each year. PLEASE spay or neuter your pets, make arrangements for your pets' continued care if they should survive you, and consider adopting a homeless cat or dog! Visit your local animal shelter or use the links below to find your new best "furriend"! 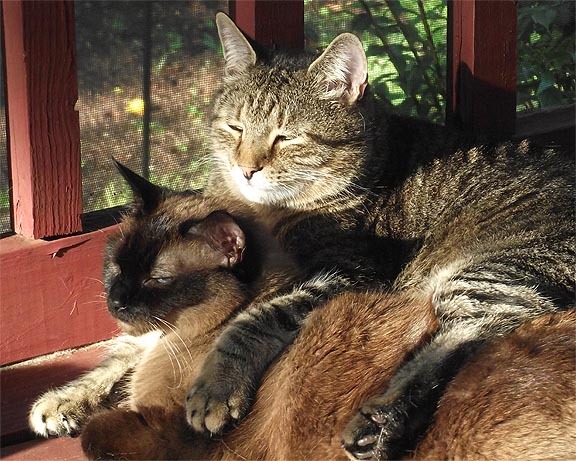 SICC is an online international community of cat lovers!